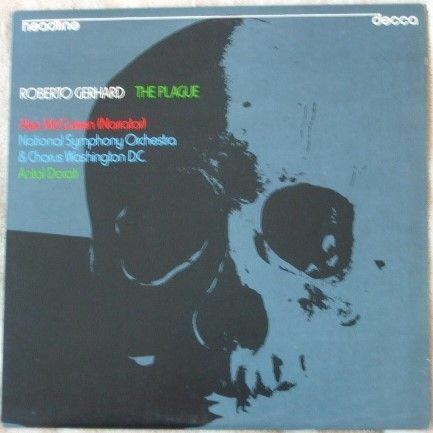 33rpm LP Record of THE PLAGUE by Roberto Gerhard, featuring the National Symphony Orchestra & Chorus Washington D.C., conducted by Antal Dorati. Narrated by Alec McCowen. Inspired by the classic novel The Plague by Albert Camus; text translated by Stuart Gilbert. 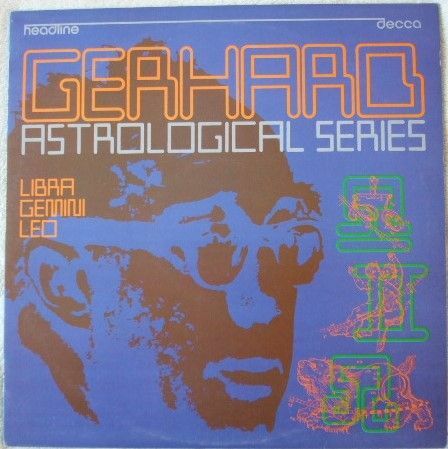 It was issued on the DECCA Headline Stereo red label in 1974. Catalogue number: HEAD 6. UK pressing. Insert included. This record features in the Best of the Bunch - Classical Section - on Harry Pearson's list (TAS) of exceptional vinyl recordings. The record itself is graded at least excellent, with just the odd light surface mark visible when viewed under normal house lighting. Play-tested on a USB turntable. Superb sound quality, with NO jumps or ticks and just the hint of faint crackle very occasionally and the odd light dust pop (hardly worth mentioning). Otherwise more or less faultless playback. Great sound as you'd expect. Minimal to no spindle wear. Labels clean. Couple of faint spider marks. The outer sleeve is graded a bit less than excellent, with just light bumping to corners and a little ringwear. The spine is intact and strong, with no loss to the lettering. The insert has a little age spotting/browning but is otherwise in excellent condition. The inner sleeve has no wear to speak of.